Great IT Job Descriptions are a great resource for any IT manager looking to add or define IT positions. 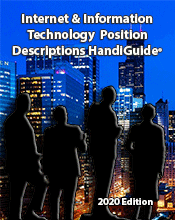 Janco has compiled complete descriptions for themost hired IT positions. Each 2-5 page description contains a detailed description of the responsibilities and of the recommended requirements for each position. The documents are in Microsoft WORD .docx format and can be easily customized to fit your unique needs. This unique resource will help you recruit and keep great staff and build the right department structure for your business. 300 detail Internet and IT job descriptions for both private and public (government) sector enterprises are available. They can be purchased individually or in bundles. Janco produces a semi-annual salary survey and the postions included in this bundle are those that Janco has compensation data for. Once there you can download the table of contents which shows each of the job description included.